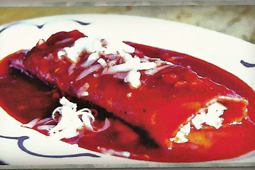 Enchiladas with Fiery Figs Mole Sauce - A recipe from Savor California, the online showcase for extraordinary gourmet foods and beverages from California. Lightly pound chicken breast and season with salt and pepper. In a pan with oil, quickly fry the tortillas. Remove each from pan and set aside. Using the same oiled pan, sauté the chicken (with onions, if desired) until cooked. Place the cooked chicken on a cutting board and slice, chop or cube it. Place the chicken, onions and 1 cup of cheese in a bowl, and mix it all up. In a separate bowl mix together the Red Chile Sauce and the Fiery Figs Pepper Jelly. Serve with sour cream or avocado. * Note: Hillary Danner's friend Linda likes to use half flour / half corn tortillas from Trader Joe's.